The blog of the silk artists of Etsy. Here we share our current paintings, ideas and more. You are welcome to join us! 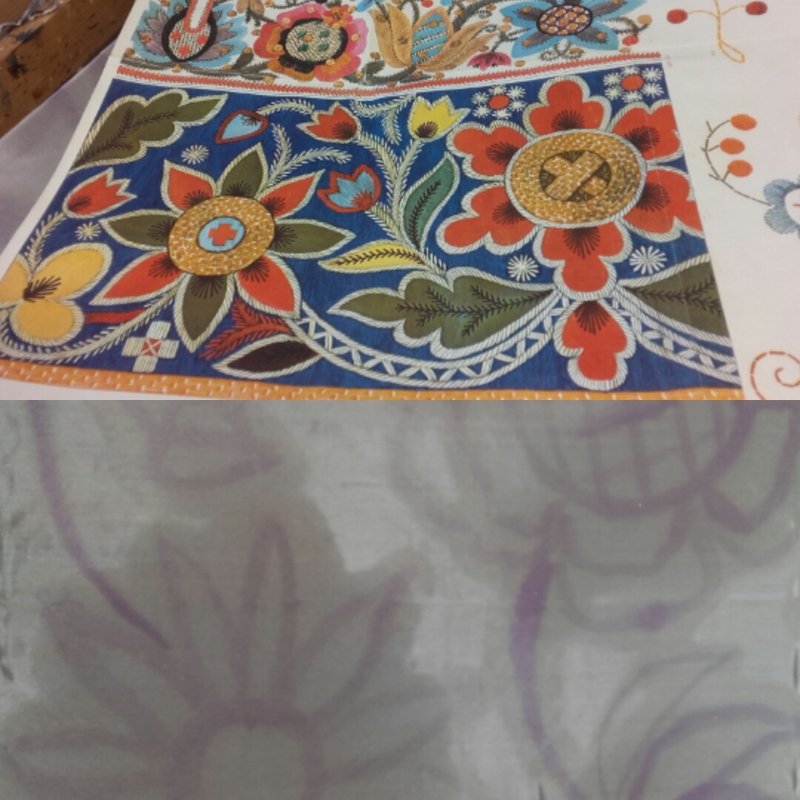 These photos are from the painting process of a silk scarf in Estonian Ethno motifs. Different motifs from Western Estonia are combined here, the scarf was a birthday gift for a dance teacher from the folk dancing group. So they wished the scarf to be in Estonian Ethno motifs, and because the dance teacher is a very bright and colorful person, the scarf was planned to be as bright and colorful. Firstly I begun with freehand brush painting. 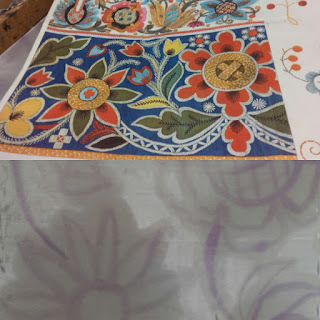 I dilutedd purple silk dye in a lot of water, so the brush line was really faint, almost transparent. Still - the place where the silk has had even a faint line, acts differently, while painted again - the dye will not spread so much. This - to avoid too much spreading, was my first aim while painting this layer. The second one was to sketch the whole design. As you can see, I did not copy the national motifs, but used them just as the source of inspiration. I have studied older handcrafts and they are seldom very symmetrical - it was not easy to achieve these times. Every master interpreted the old patterns in her or his own way. I wished to load the scarf with the energy of this free interpretation, so I chose the flowers from the old patterns, that best fitted my design and combined them freely. The result is not too symmetrical. 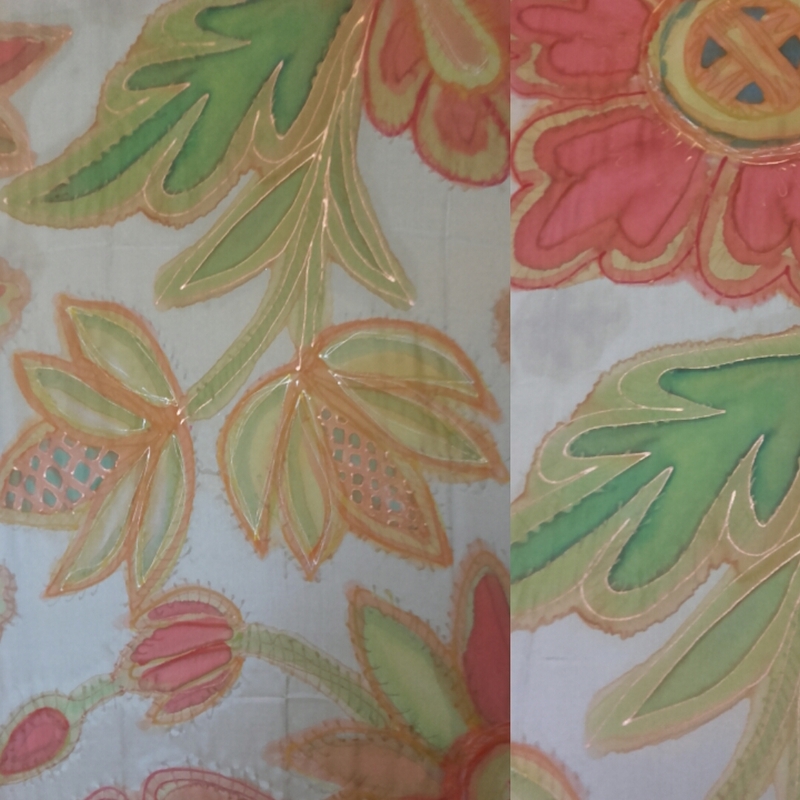 Another option is to print out the folk patterns in suitable size and to copy them carefully on silk. This is not my way, because it changes the energy and power of these old patterns - while drawn freehand, they are much more powerful. When the first layer was dry, I did another round of brush painting, this time using the colors I planned to use on the flowers. When the second layer of dye was dry too, I added the gutta lines (they cannot be added on the moist silk, because they won't work as the resist this way). I used Marabu guttas - transparent, red, yellow, copper. 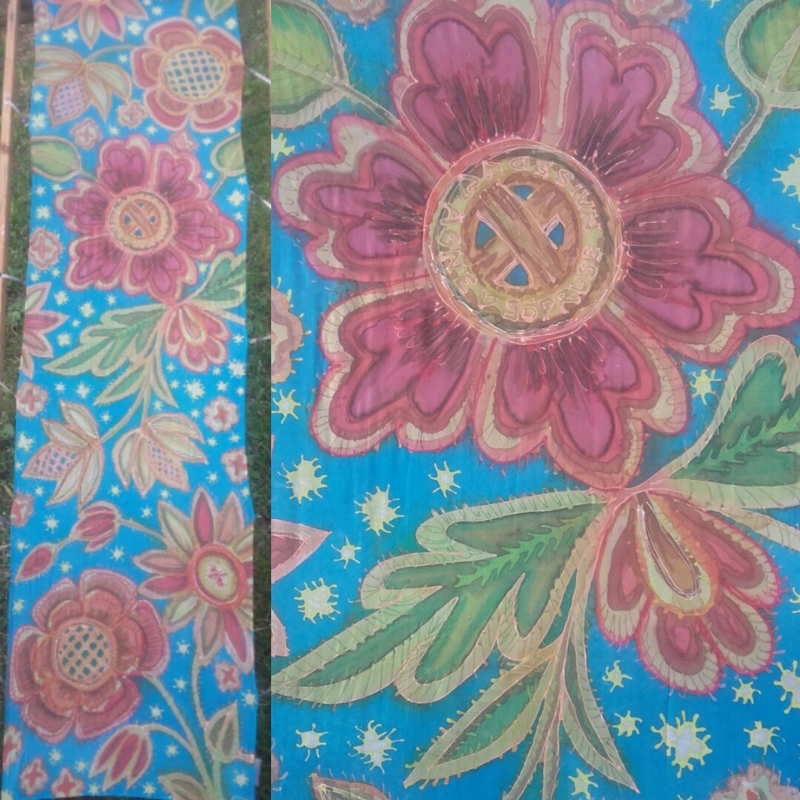 I carefully drew all floral motifs of the scarf. 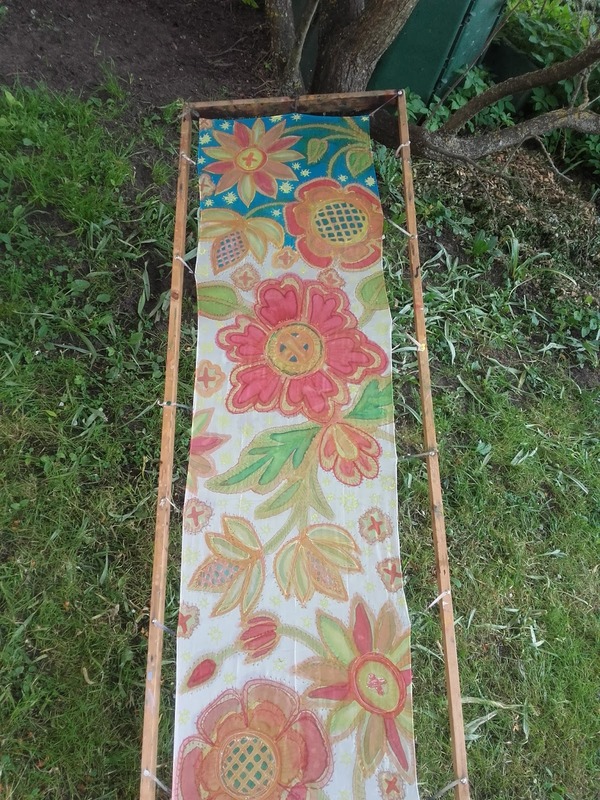 After letting the gutta to dry, I added the third layer of dye. I painted a bit inside the flowers and leaves. Then the second layer of gutta was added, to make the design more precise and add some detail (like the small circles and crosses between the flowers. When this gutta was dry too, it was the time to paint the background. 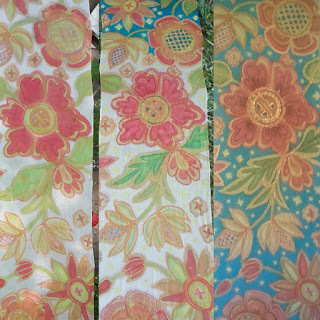 Before doing it, I sent the photos of painting process to the women who had ordered the scarf, to discuss with them the color of the background - should it be bright blue (as original) or maybe dark red, rust brown, dark mossgreen, purple, beige? Each option had made an entirely different result. The answer came fast - cornflower blue was the color. So I begun to brush paint the background, with large, but sharp ended brush. 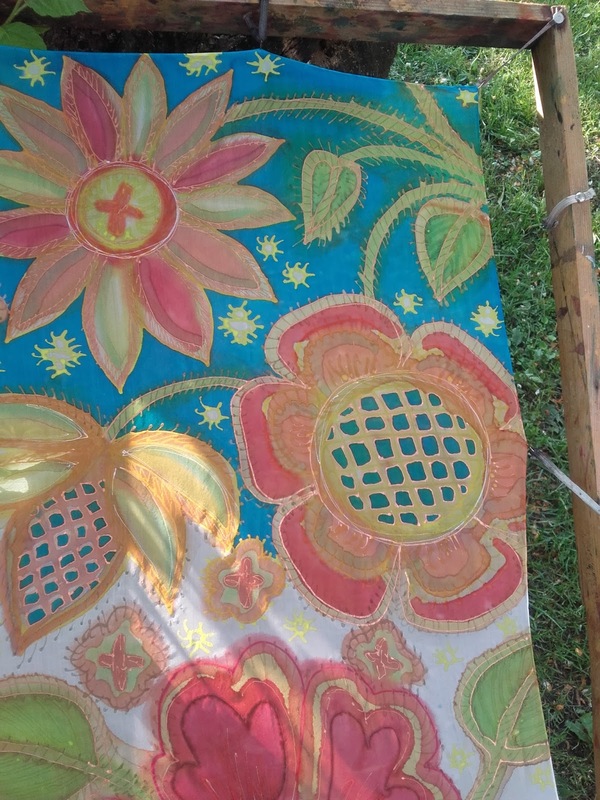 This is a work that needs speed and concentration - when painting outside, especially in sunshiny (like I did), the silk dye tends to dry very fast. When dry and wet dye met, the form some special sharp lines. Sometimes they are really cool, but not on this design. So I had to paint from one end to the other, without a break. 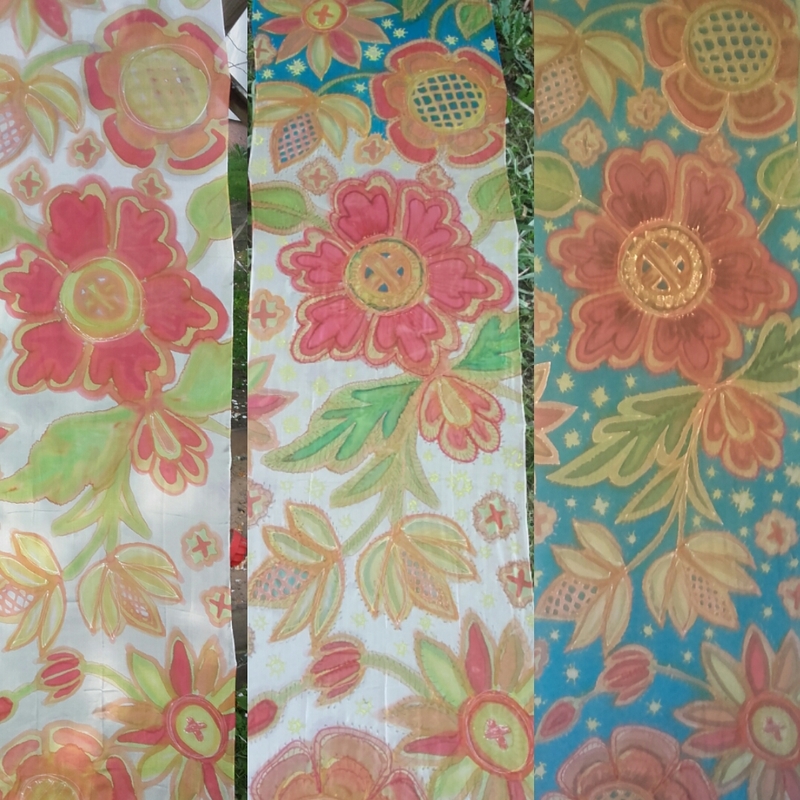 While this was done, I sent the photos to the people who had ordered the scarf, again, asking, could I add some contrast. 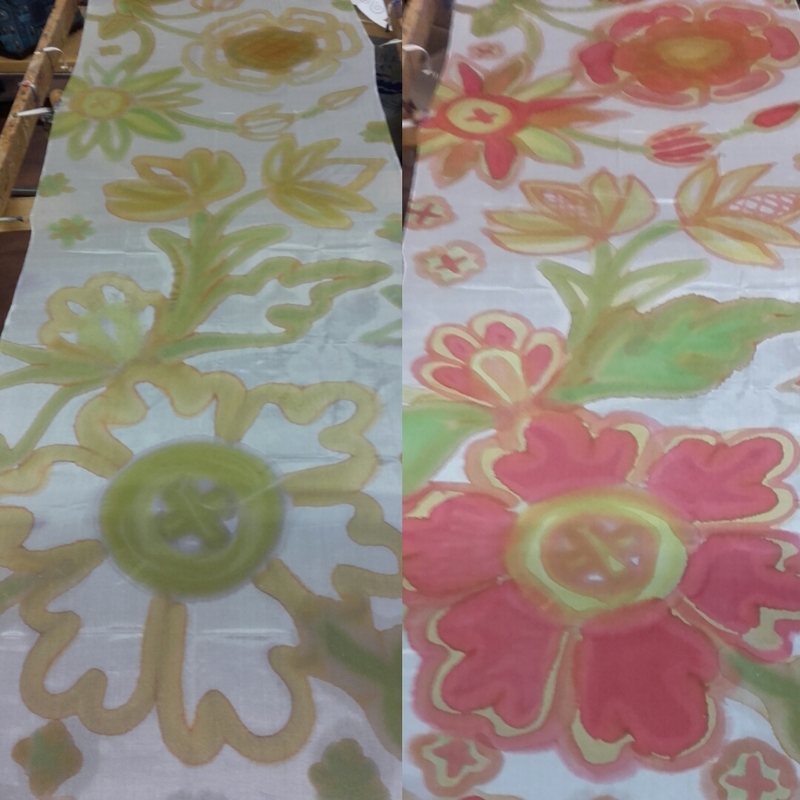 They agreed, so I added some darker shades of red and green, to make the floral motifs to pop up more, and the scarf was ready to steam set. After steaming the scarf, I washed it (to get rid of transparent gutta lines and the extra dyes), rinsed it in Lenor to make the silk softer, and ironed the moist scarf. Because it was for an Estonian person, I wrote a poem to her too (unfortunately this is something I can do only in my mother tongue, Estonian), and packed the scarf to a paper bag with logo. The dancing teacher was very happy about her Birthday gift. Where did you found info about this blog? 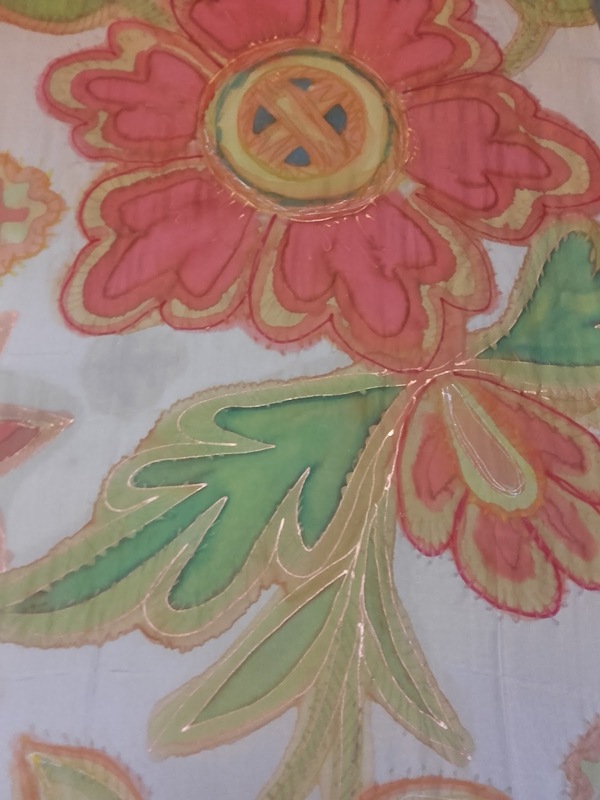 Follow Pinterest's board Hand painted silk.